A side project proudly started by police K-9 handlers. We sell custom K-9 hats, apparel, decals, license plates, and more designed by a K-9 handler for police/military K-9 handlers and their supporters. Check out the Shops and Design Gallery. 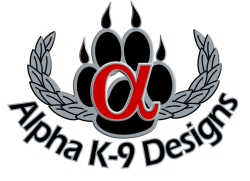 We have Explosives Detection, Patrol/Narcotics, 2** K-9, SAR and our American Alpha & Alpha Breed lines of K-9 designs. We customize K-9 apparel, license plates, kennel tags, decals, mugs, patches, and vinyl banners. Email us for more info at alphak9designs@gmail.com or fill out a Custom Order Form. * Please take our short design survey so we can learn more about what you like! Or give us some feedback on an item you purchased!